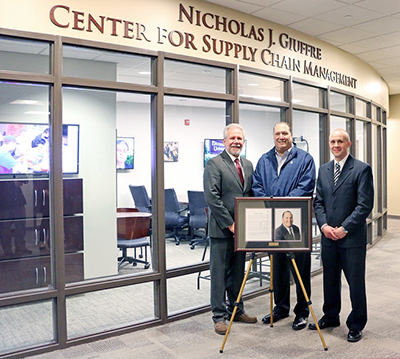 Dedicated on Feb. 25, 2016, the Nicholas J. Giuffre Center for Supply Chain Management provides new resources, relationships, and opportunities for students in the Zeigler College of Business who are interested in supply chain management and information technology. Identifying an important capability, Nicholas “Nick” Giuffre, a Bloomsburg University graduate, encouraged the supply chain/information technology capability, having a vision to develop an important skill set and competitive advantage for Bloomsburg University students. Margaret O’Connor, D. Sc., associate professor of information systems and communications and chairperson of Innovation, Technology, and Supply Chain Management Department holds a Doctor of Science in Information Systems and Communications, an M.B.A. and B. Sc. In Marketing. As chair of this interdisciplinary department and director of the Center, her corporate background in brand management includes extensive value chain experience in consumer packaged goods and marine leisure industries. Amit Arora, Ph.D. is an Associate Professor of Supply Chain Management and Co-Director of Nicholas J. Giuffre Center for Supply Chain Management at Bloomsburg University (BU). Prior to joining BU, he was an Assistant Professor and Director of Global Logistics & International Business Education and Research Center at Savannah State University (SSU). Amit graduated with a Ph.D. degree in Logistics and Supply Chain Management from Georgia Southern University (GSU) in 2014. He earned his SCOR (Supply Chain Operations Reference) certification from Supply Chain Council in 2013. He has extensive industry experience having worked in the auto industry in India for about 10 years. He worked with Hyundai Motors India for seven years at the corporate headquarters in the after sales division where he was responsible for providing warranty and technical support and training to all India dealers and overseas distributors in Europe, South America, Africa and Asia. He was also responsible for financial chargeback to suppliers for quality defects in the field. Later, he moved to work with Honda Motor India in the service division where he was responsible for working closely with Quality Control division to investigate and solve product related defects in the field. He was also responsible for implementing the Global Dealer Management System (GDMS), a web-based integrated software connecting Honda India headquarters with all dealer locations. Bronwyn Laughner is an adjunct instructor in the departments of Innovation, Technology, and Supply Chain Management and Management and International Business. Professor Laughner has over 20 years of experience in fast-moving consumer packaged goods in roles of sales, operations, customer relationship management and finance. Professor Laughner received her bachelor’s degree from Lycoming College and her Master of Business Administration from Bloomsburg University. Her area of interest focuses on the intersection of supply chain operations and data analytics. Nicholas J. Giuffre ’78 contributed a $2.5 million blended gift in February 2016 to the BU Foundation through the university’s It’s Personal Campaign. The gift establishes the Nicholas J. Giuffre Center for Supply Chain Management in the Zeigler College of Business. His gift also endowed the Nicholas J. Giuffre Distinguished Professor in Supply Chain Management to support the university’s supply chain management major and experiential learning opportunities for students. It is the first endowed professorship in the Zeigler College of Business. Giuffre serves as a member of the Bloomsburg University Foundation Board of Directors, the Zeigler College of Business Advisory Board and the It’s Personal Campaign Cabinet.